Looking to unleash your inner detective? 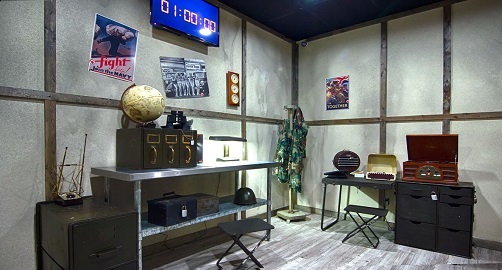 Ultimate Escape Game in Dallas, TX is a unique escape room with mind-bending puzzles and a tension-inducing 60-minute time limit. Working together, teams navigate a labyrinth of riddles and ciphers to complete their task and escape the room before time runs out. “We have six rooms, and they’re all completely different from each other,” says Brittany Sandige, General Manager and daughter of the owner. The rooms are multi-leveled, some containing up to four separate sections, full of elaborate puzzles and set pieces. Each room is completely unique. Besides The Vault and Amnesia, there’s four other rooms that take place in different time periods and places. The more modern ones are Hackers, where you must unmask an unknown hacker network, and Dallas, in which you must discover the 23rd ingredient in Dr. Cola’s secret pop recipe using puzzles centered around the city’s history. Meanwhile, Enigma takes place during WWII. Crack the Nazi Enigma Code and stop an assassination. Roulette involves getting into Al Capone’s speakeasy during Prohibition by navigating Chicago’s underground tunnels. The rooms of Ultimate Escape Game are impressive and elaborate. From The Vault’s security alarm going off once you’ve stolen the egg, to the chains on the beds and cryptic writing on the walls in Amnesia, it feels less like a game and more like an adventure straight out of the movies. “We really go above and beyond when we design these rooms,” states Sandige. She, her husband, father, and a creative team of engineers, electricians, and more actually come up with the games themselves. She and the staff then test the rooms to make sure they’re audience-ready. “It’s trial and error. We have to play them ourselves. We over-make the puzzles, because it’s easier to take puzzles out than add them in.” After about a week or so of testing (to gauge the age and difficulty level) they launch the room. 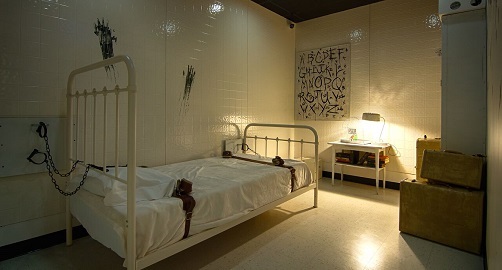 Escape rooms have been steadily growing in world-wide popularity and appeal to a wide audience. “We can do an 8-year-old’s birthday party to groups of 25 doing team building to family reunions to bachelorette parties,” says Sandige. “It’s the entertainment of it. I think getting a group together and actually doing something and not just going to the movies appeals to people.” With puzzles, a twisting story, and immersive set pieces, it certainly seems to bring people back. “I think the adrenaline rush is part of it. Sometimes a group will finish a room and ask to do another right away,” laughs Sandige. “These rooms are designed for teamwork. That’s why it’s great for families and friends.” Teams must work together to solve puzzles, with people of different skill sets having to rely on each other. That’s also why it’s a popular team-building exercise for corporate events. After an hour solving puzzles, they’ll often have a seminar to gage how everyone did; who took leadership, who stood back in the corner, who got the most involved. “It’s definitely a bonding experience,” says Sandige.